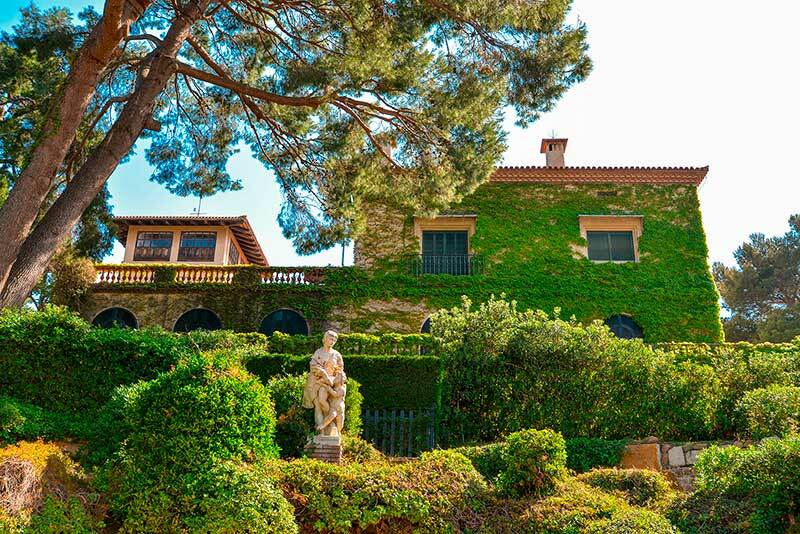 Despite Lloret de Mar‘s reputation and belief that it is an exclusively youngsters town, this coastal village actually has much more to offer if you know where to go! Lloret has some of the nicest beaches on the South Costa Brava, and has in fact more beaches than neighbouring Blanes. It is thereof a great option for families with teenagers or young adults who want to go out at night, taxis are easily available for them. All our villas are located in residential urbanisation, away from the crowded center of town. So you won’t even notice the hussle! In high season we do recommend you to avoid the center of town, as it gets crowded with party goers, the same goes for Lloret’s main beach. It is the largest beach but also the busiest and is great for young adults with many bars, music, etc. but not so much for families with kids. Platja de Fenals: this is Lloret’s second main beach, but popular between families instead of youngsters, and located in Lloret’s suburb of Fenals. This is a very long sandy beach that has a bit of everything for every family member: water activities, volleyball, children playground, various bars, restaurants, etc. Easy to reach by car and has a nice path along the beach to take a stroll. 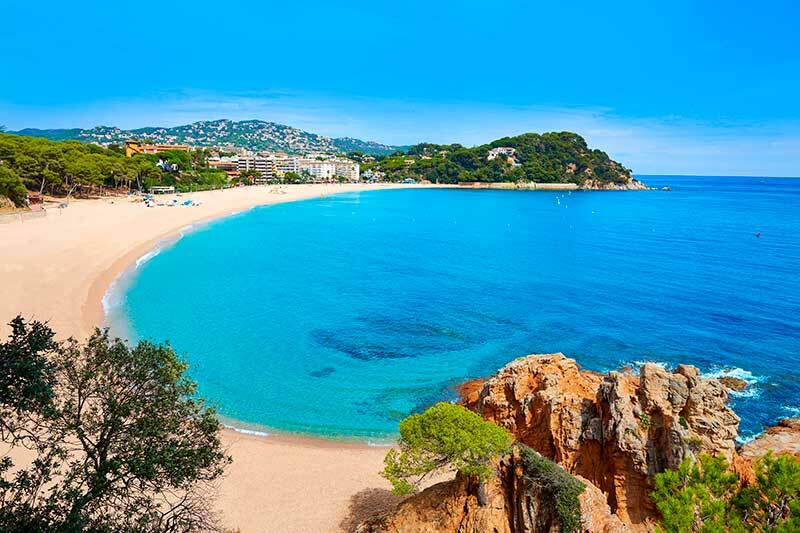 Cala Canyelles: this little piece of paradise is located at the far end of Lloret, direction Tossa de Mar. It has a small yachting marina and hosts one of the best restaurants in town: Restaurante Sybius. Enjoy fresh fish or a paella on their terrace, with views of the bay. There’s also a nice beach bar where you can get ice creams, sandwiches and cocktails. Showers, toilest, life guard. Parking space available (small, so be early). You can also reach it by boat, there’s a boat cruise that connects most of the beaches and that runs various times a day. Cala Boadella: located on the other far end of Lloret, before reaching Blanes, lies this hidden gem, unknown to most tourist. Access to the beach is via a sandy path that goes down, thus uphill to get back, but definitely worth it! Its scenary is so beautiful that it is used frequently by film crews for location shots. Parts of the movie “Sahara” starring Penelope Cruz and Matthew McConaughy were filmed here. The far end of the beach has a naturist part. In high season don’t expect a deserted beach as it still crowded but much more peaceful compared to Lloret’s main beaches. Beach bar available, shower, toilet and life guard. Cala Banys: This is not a sandy beach for sunbathing but is actually a rocky cove, so the place for fishing and snorkeling. You can reach it on foot via the coastal path that starts on Lloret’s main beach, or by car. It’s a nice walk to enjoy the beautiful scenery and you can combine it with a visit to the stunning coctail bar “Cala Banys” located right on the rocks between palm trees. This bar has been famous between locals (and tourists) since the 19th century. It is open only for adults and can also be reached by car. Enjoy a caipirinha or mojito during the day or night while enjoying the music, atmosphere and surroundings. 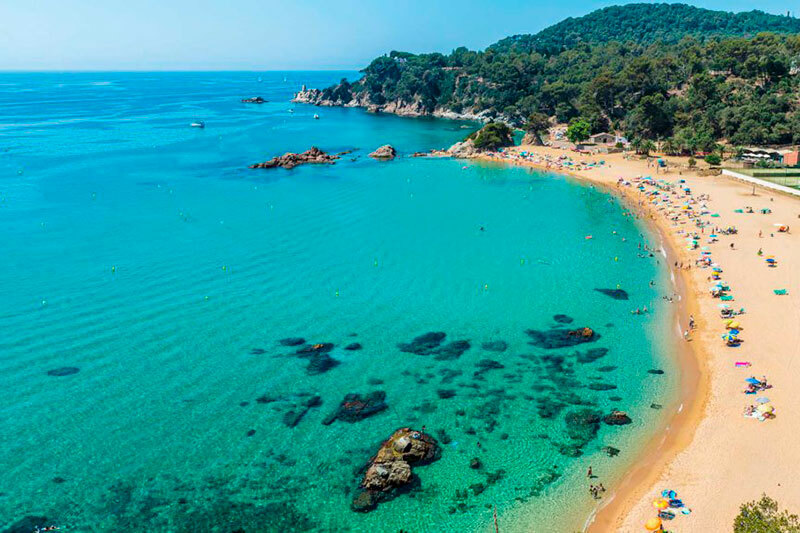 Cala Santa Cristina & Cala Treumal: located between Lloret and Blanes, these two beaches are connected. Surrounded by pine trees, this beach is ideal for children as it has fine sand and a gentle slope. Both beaches have large parkings so easy to get by car. Many of our villas are located in this beautiful bay.